JESUS'S MOVE from Nazareth to Capernaum (Matt. 4:13) was a strategic decision. Capernaum was on the main highway through Galilee. Both Roman and temple taxes were collected there, likely because it was the eastern outpost of Galilee (the cities further east were Hellenized). The city had royal officials as well as a contingent of Roman soldiers. 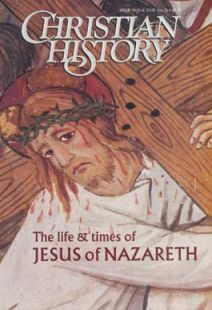 By some accounts, the town may have had a population of 10,000 to 15,000 and may have been larger than Nazareth. Though it was not among the largest or most influential of Galilee’s cities, it was at a crossroads. Miracles, exorcisms, and healings accomplished there would enjoy a wide report throughout the country. It was also a fishing village, one of over a dozen small fishing anchorages along the Galilee seacoast. It shouldn’t surprise us, then, that much of Jesus ministry and teaching were shaped by the culture of lakeside Galilee. The Gospels contain many stories about life on the lake. When there was danger of a crowd overwhelming Jesus, the disciples had a boat ready for a quick departure. A boat also provided restful solitude. He was so comfortable in boats, he taught from them to crowds on the beaches of the sea. At one point, he even joined the disciples on their boat when they were at sea—and he walked on water to them. The fishing trade provided Jesus with raw materials for parables as well as a job description for his apostles ("I will make you fishers of people"). Fish stories abounded in his ministry: he described the kingdom of God as a great haul of fish, and when he fed the 5,000, he provided fish along with bread. He even located money for taxes in a fish’s mouth. Net fishing was the stock-in-trade of the people who lived on the lake, and the Gospels point to Jesus’ knowledge of this. Hook-and-line fishing was known but used far less since it yielded fewer fish, but Jesus once told his followers to catch a fish using a single line (Matt. 17:24–27). Mendel Nun, a lifelong fisherman at the Israeli kibbutz Ein Gev, and a student of ancient fishing practices, argues that there were three types of net fishing in the first century: the drag net, the cast net, and the trammel net. The drag net was the most ancient form, dating from the third millennium B.C. in Egypt. A wall-like net, with weights on the bottom and cork on the top, was first pulled along the coast. Then the lead rope was swept across the sea by boat and pulled back to shore, pulling in fish as it came. The fish were then sorted and distributed to the workers. The drag net is mentioned nine times in the Old Testament, and Jesus used this image to symbolize the day of judgment (Matt. 13:47–48). The cast net was circular and measured about 15 to 20 feet across. It had lead weight sinkers attached to its edges, and was tossed into the sea by a lone fisherman. It landed on the water like a parachute, sinking and catching unwary fish. The fisherman then either dove into the water to pull the fish out individually or to lift the entire net into his boat. Ancient Egyptian paintings depict this method, Matthew’s and Mark’s Gospels refer to it by its proper name, and Ezekiel 32:3 may refer to it as well. Simon and Andrew were using cast nets when Jesus called them. The third type was the trammel net (the only type still used today). This was a compound net, built from three “layers” connected at the top by a head rope (with cork) and a foot rope (with lead weights). The outer nets were identical, with wide openings. The inner net was finely meshed and loose, flowing easily in and out of the outer nets. The net was spread in the water in a long line (generally at night) and held while other fishermen scared the fish toward it with splashing. The fish entered the first net easily, entangling themselves hopelessly between the fine mesh and the third outer net. Hauling the net ashore, disentangling the fish, sorting them, and repairing the many breaks during the day took a lot of work. The Old Testament uses the image of these “entangling nets” to describe the futility of humanity (Eccles. 9:12; Job 19:6–8). In the story of the miraculous catch of fish (Luke 5:1–7), the men had already fished all night and were repairing their trammel nets. Jesus told them to set sail again and drop the net once more. This was a genuine act of faith! “When they had done this, they caught so many fish that their nets were beginning to break.” A daytime catch without effort! The sea has yielded thousands of net sinkers from antiquity as remarkable testimony to livelihood of fishing. Jesus, though a carpenter, learned about fishing because his first converts knew the art well, and he seems to have known the types of fish in the sea. On one occasion, Jesus said, “If your child asks for a fish, will you give him a snake instead?” Jesus was likely referring not to a snake but to the Hebrew Sfamnun fish (a catfish). Because it had no scales, it was unlawful to eat. This is another indication that if we are to understand the teachings and stories of Jesus, we cannot neglect to understand the fishing culture of first-century Galilee. Gary Burge is professor of New Testament at Wheaton College (Ill.) and author of a commentary on the Gospel of John (Zondervan, 1998).